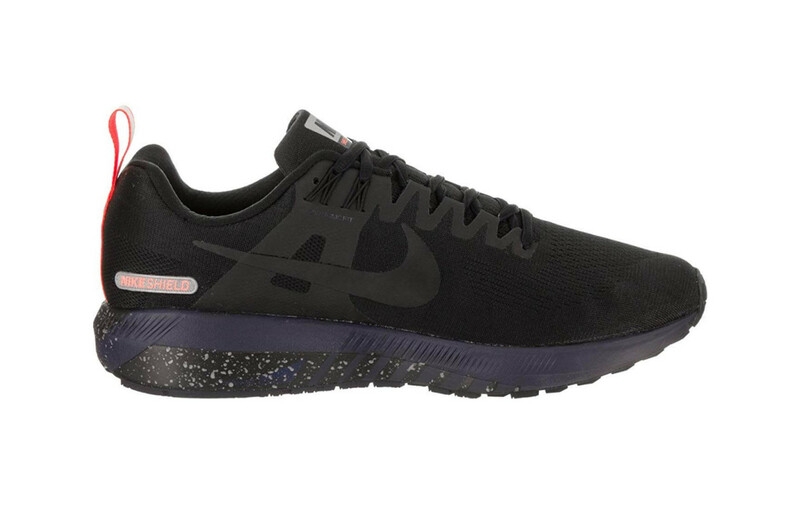 Nike Air Zoom Structure 21 Shield - in Apr 2019? Designed especially for overpronators, the Nike Air Zoom Structure 21 Shield has been widely praised for both its simplistic style and supportive features. 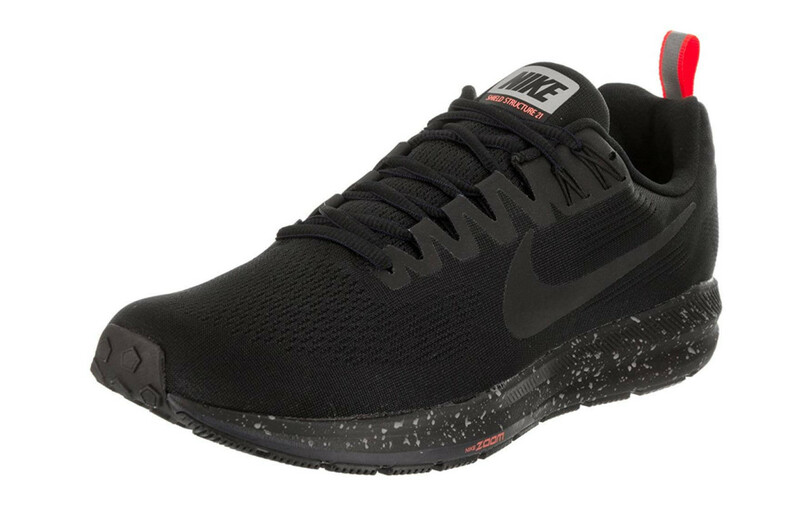 These seemingly basic running shoes incorporate a number of carefully engineered materials and built-in stabilizers that cushion the foot and keep it properly straightened out. Many buyers have noticed a massive difference upon wearing this shoe, and feel that their joint and muscle pain have been significantly reduced. In addition, thanks to its strong traction and water-repellent upper, reviewers love that they can safely wear this shoe in several different types of weather. It has received such positive feedback all around that one of reviewers very few complaints is that it does not come in a wide enough color range. The Air Zoom Structure 21 Shield’s outsole is constructed of two different rubbers: Duralon Blown rubber on the forefoot area and BRS 1000 carbon rubber. When combined, they offer a perfect balance of comfortable cushioning and a durable grip that reviewers are extremely pleased with. They also note that they make incredible use of two different tread patterns: a waffle-iron design around the arch and at the toes along with deep flex grooves from the heel up through the shoe’s lateral side. Not only did this feature ensure them stronger traction, but it also proved to be more flexible than previous releases. The Air Zoom Structure 21 Shield has a dual density midsole constructed of Phylon and Cushlon foams placed on either side of the foot to give a soft cushioning. A Zoom Air unit has been placed in the forefoot, which gives each step a noticeable spring. And a crash pad at the base of the heel not only absorbs shock but also works to correct overpronation. All of the components together give buyers a wonderfully cushioned step that keeps their feet stabilized throughout the day. In recent years, shoe designers have relied more and more on knit material for uppers. And the Air Zoom Structure 21 Shield’s Flymesh upper is one of its standout features. Reviewers have noticed that it’s not only very comfortable but also much more lightweight and breathable than previous Air Zoom models. They also find this shoe easy to slip on thanks to its heel pull and tongue notches. Stabilizing features are also in place, including an internal arch band. It features a traditional lacing system, with the last two eyelets made of Flywire cables for a more secure fit. But its greatest selling point is its ability to repel water. The material is pretreated during construction, and buyers are thrilled to know that they have a shoe they can wear for jogs in the rain. The median weight for the men’s Air Zoom Structure 21 Shield is 10.4 oz, while 9 oz is the average weight for women. For a stability shoe, this proves to be surprisingly lightweight. Reviewers love the fact that this shoe provides such a high level of stability and durability, yet doesn’t sacrifice lightness or comfort at all. Because its materials and features are so finely tuned, they don’t have to take up any kind of bulk. Reviewers have noted that not only is the Flymesh upper more lightweight than previous Air Zoom Structure models, it also provides much more ventilation. More and more, this is becoming a needed feature for serious runners. Not only does this ensure a more pleasant and comfortable wear, but in the long run it also helps to combat foot odor and reduces the likelihood of rashes, blisters, and infections. This, combined with the water-repellency, ensure a dry wear for its buyers. Nearly all online reviewers loved the level of comfort that the Air Zoom Structure 21 Shield offers. Its dual density midsole, comprised of Phylon and Cushlon, offers greater cushioning than the one found in previous versions. The materials constructing both its outsole and midsole prove to be very cushiony while still providing support and stability. And the inside of its breathable Flymesh upper has been described by several reviewers as feeling sock-like. Furthermore, its water repellency ensures that runners stay comfortable even while in the rain or walking through small puddles. The look of the Air Zoom Structure 21 Shield is extremely simplistic, which is exactly what buyers love as it goes with just about anything. Its midsole features a unique speckled pattern that buyers are drawn to. Its upper is smooth, except for some ridged patterns on the top and sides, and has reflective qualities to make it visible even in low light. The famous Nike logo features prominently on both sides of the shoe. A grey and bright red pull tab, contrasting the shoe’s otherwise muted colors, is placed at the heel for easier insertion. The only downside of this model is that it only comes in two different colors: black and navy blue. Aside from its stability and comfort level, the Air Zoom Structure 21 Shield has also received praises for its durable wear. Both the tread patterns and level of grip on this shoe stay sturdy even after months of heavy wear. The materials that make up the entirety of its midsole are able to resist compression. As a result, buyers noticed that their feet stayed perfectly cushioned much longer than with other running shoes they’ve previously owned. And while some shoes with water repellency tend to lose this feature over time, this shoe continued to stay safe from water even after many months of usage. While it seems simplistic at first, buyers point out that the Air Zoom Structure 21 Shield offers them a surprising amount of protection. The materials and unique tread pattern of its outsole cushion provide a firm grip to prevent accidents. The crash pad located within its midsole greatly reduces impact and corrects pronation, which buyers say also reduced the amount of pain and discomfort they feel by the end of the day. But one of the greatest selling points of this shoe is that it’s water repellant. With its Flymesh upper being pre-treated as it’s constructed, runners can easily move through rainy conditions without risk of slipping and remain completely dry throughout. Further protection is ensured with 360 Reflectivity, making these shoes visible even during nighttime hours. Those who frequently wear the Air Zoom Structure 21 Shield have marveled over how well it is able to adapt to multiple conditions. 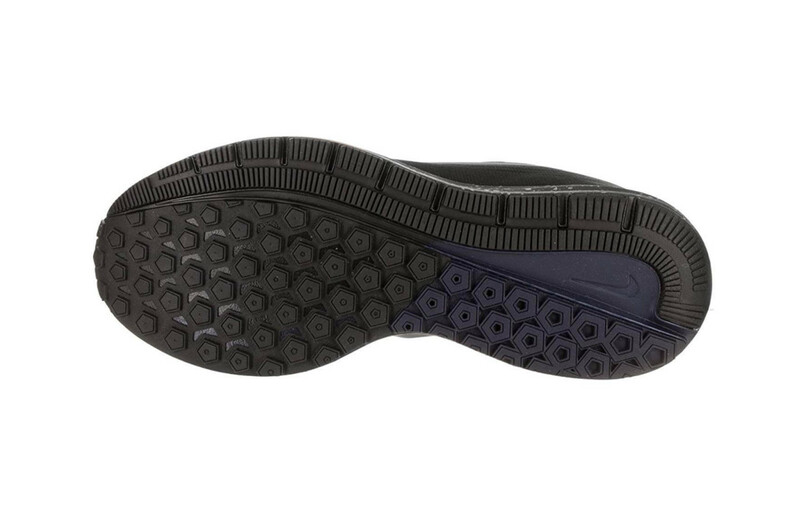 The outsole’s two different rubbers and tread patterns ensure an easy transition between everyday wet and dry surfaces. 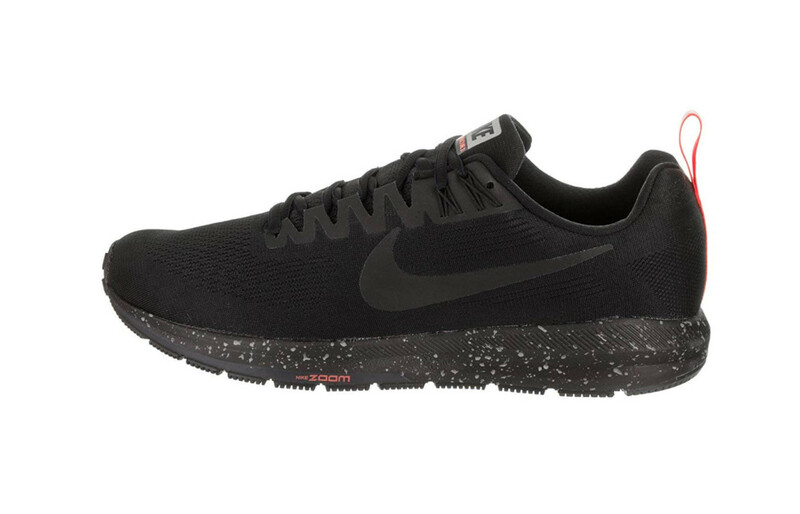 The midsole’s two different foam materials, heel-based crash pad, and Zoom Air unit, work together to absorb shock, provide an added bounce, and keep the foot cushioned all day. Reviewers have noticed that the amount of pain and discomfort they normally felt throughout the day was significantly reduced. Its water-repellent upper ensures a perfectly dry run in mild rain and through surprise puddles. And the 360 Reflectivity even enables the runner to be more easily seen during evening or nighttime jogs. Reviewers stated that the Air Zoom Structure 21 Shield is one of the more supportive shoes they’ve ever worn. Its outsole's dual-purpose features not only ensure strong traction but also provide a base for the foot to stay properly cushioned. The midsole’s multiple components reduce the impact of each step while keeping the foot straightened without any discomfort. On the inside of the shoe, an internal arch band and heel counter work together to stabilize the arches and hold the foot in its proper place. The Flywire cables that form the top two lacing eyelets further ensure that the runner’s overpronation stays corrected during wear. The Air Zoom Structure 21 Shield is meant entirely for road running and everyday wear. Its multi-surface tread pattern and water repellant upper ensure that they can easily perform on both wet and dry terrains. Reviewers say they can comfortably run and walk on many everyday terrains, be it cement and concrete or even a dirt road, and that they felt completely secure even during mild rainstorms. That said, they are still not meant for heavy outdoor sports such as hiking or rock climbing. Across all major online outlets, the Air Zoom Structure 21 Shield runs for $135. While a few reviewers found this to be too expensive, most considered the cost to be perfectly reasonable. With all of its carefully engineered features, stabilizing characteristics, and durability, most buyers found that this shoe was well worth the money that they spent. Though sales are available on smaller outlets, it’s always best to check the listings reviews ahead of time. The Air Zoom Structure 21 Shield features two very different tread patterns, which reviewers say works very much in this shoe’s favor. Along the outsole’s medial side is a pattern that closely resembles a waffle iron, which provides greater traction on multiple surfaces. On its lateral side is a series of horizontal lines called Deep Anatomical Flex grooves, which ensure a more natural range of motion. According to many buyers, these patterns have proven to be a much-needed update from previous models and perform significantly better on wet surfaces. Despite its stabilizing features, buyers were pleasantly surprised to learn how flexible the Air Force Structure 21 Shield is. This is thanks primarily to the shoe’s Flymesh upper and the Deep Anatomical Flex Grooves on its outsole. As all other components work to ensure pronation stays corrected, these two features ensure a completely comfortable and natural range of motion throughout the day. Reviewers greatly appreciated the fact that they could get the support and stability without feeling as if their movements were restricted. The Air Zoom Structure 21 Shield was designed specifically for those who overpronate. Though these features seem minimal at first, reviewers with this condition have definitely felt a difference upon wearing these. The top two lacing eyelets are made of Flywire cables, which better set the foot in place and keeps it supported throughout the day. Its dual density midsole offers cushioning, while its heel-based crash pad actively corrects pronation. An internal heel counter wrapped around the Achilles provides further lockdown. And as for the base, the outsole’s BRS 1000 carbon rubber ensures a sturdy and durable grip. With a 28mm heel height and 18mm toe height on both men’s and women’s shoes, the Air Zoom Structure 21 Shield has a heel-to-toe drop of 10mm. This is an average measurement for athletic shoes of all brands. Reviewers do note that they have a completely natural stride while still receiving considerable heel support as they move around. Ever since it was first released, the Nike Air Zoom Structure 21 Shield has received huge praises from both buyers and critics alike. Proving once again that no one can judge a book by its cover, this shoe offers both a sleek design and a surprising amount of supportive features built in. Overpronators love knowing that their condition can be comfortably corrected throughout the day as they wear a shoe that’s as perfect for long-distance running as it is for work or casual tasks. Though some do wish that it was available in a wider range of colors, the fact that it can be worn almost anywhere and still maintain an incredible amount of support has proven to be more than enough to keep buyers satisfied.